Most teens will suffer from acne at some point. Teenage acne is caused by an oily substance called sebum clogging pores, causing a breakout of spots on the face, neck, back, chest, and shoulders. Whiteheads: White dots that are pores impacted with oil and skin covered by skin layers. Blackheads: Black bumps that are impacted pores in which material pushes out through the follicles. The black colour is not from dirt. It may be from bacteria, dead skin cells, and matter that react with oxygen. Papules, pustules or nodules: More serious lesions appearing red and swollen due to inflammation or infection of the tissue around the clogged follicles, which are often painful and feel hard. Hormones called androgens play a huge role in teenage acne as these are increased in both boys and girls during puberty. Androgens cause the skin's oil glands to increase in size and produce more sebum. Genetics, diet and stress can also affect a teenager’s skin condition.Whilst acne isn’t a serious health risk, it can not only cause permanent scarring, it can also damage self-esteem. Aspire Clinic’s acne treatment, CLENZIderm M.D.™ for teenagers is clinically proven to penetrate deep in to the skin’s layers to target the source of acne, giving clearer skin fast – in as little as one week, treating existing blemishes and helping to prevent future breakouts. P. acnes — the bacteria that causes acne — flourishes deep in the pores, making it dif­ficult to reach. CLENZIderm M.D. is uniquely formulated with 5% benzoyl peroxide (BPO) and salicylic acid to target P. acnes at the source. Aspire also offers the Dermalux LED Phototherapy as either a standalone treatment for acne or as a complimentary therapy to the CLENZIderm M.D. treatment. Dermalux is a relaxing, pain free treatment with no downtime. The treatment uses the following LEDs to trigger a variety of skin enhancing processes, meaning that visible benefits continue to appear even after the treatment has finished. LED Red to boost collagen and elastin production, even out skin-tone and texture, soothe redness and shrink enlarged pores. LED Blue to calm the skin and help to improve skin clarity. It is also a powerful anti-bacterial treatment that treats acne, normalises oil production and prevents breakouts. Near Infra-Red to calm redness and irritation in the skin. As well as being anti-ageing, it also helps relieve pain and inflammation on the skin. Aspire’s skin experts are able to treat teenagers suffering from active acne aged 14 years and up. If under 18 years of age, patients must be accompanied by a parent/guardian. Click here to book a free skin consultation with one of Aspire’s experts. When you look in the mirror do you see a clear complexion or do you notice tiny spider veins on your cheeks and around your nose? Are there patches of pigmentation or is your skin prone to flaring up and looking flushed? Aspire is excited to announce the launch of Lumecca, a brand-new treatment to tackle skin problems such as pigmentation and spider veins, that will leave your complexion clear and radiant. Lumecca is the most powerful intense pulsed light (IPL) to treat pigmented and vascular lesions. The treatment uses light that is converted into heat energy, suppressing pigmentation and eliminating spider veins, whilst at the same time stimulating collagen and elastin, resulting in a clearer and more radiant complexion. Lumecca can be used on all areas of the body. The most common areas of treatment are the face, neck, décolletage, legs, hands and arms. During treatment there will be a bright flash of light and a slight prickly sensation. Redness and a slight warming of the skin are normal and usually subside within an hour. A course of three treatments is recommended, but patients notice improvements after just one session. Results can be seen a few days after the first session and will continue to improve in the coming weeks. Results of vascular treatments can be seen within two weeks. To celebrate the launch of Lumecca, we are offering £100 off a course of three treatments in March. Book your complimentary consultation now. Firstly, I must explain that I had no idea that this excellent skin system even existed until, after many hours of internet trawling, I found Aspire. I researched Aspire fully, checking out client reviews and more importantly looking for any negative reviews, which, I have to say I found very few, any I did come across were personal opinions and not related to a particular Aspire professional, that’s just human nature. Anyway that’s how I became part of the Aspire family. I booked a consultation with Jenny for a Sweetheart Thread Lift back in April 2018. Jenny talked me through everything from the form filling to any discomfort I might experience and how to prepare for the procedure. To cut a long story short I have the most amazing jawline now – totally jowl free! Following the treatment Jenny introduced me to Lisa as I had a particular problem with a very large age spot on my right cheek and was considering getting the carbuncle zapped by lasers! After a long consultation with Lisa she explained that as the discolouration had been present for quite a few years I would probably need a number of laser treatments, which even then may or may not clear the area. Lisa gave me some leaflets on the Obagi system and recommended that the Nu-Derm programme would work best for me. The system is designed to, over a period of either 18 or 24 weeks, clear discolouration, acne and sort those pesky wrinkles out. Me being me went home and undertook some thorough research – the programme is not cheap so I wanted to be absolutely sure that this would work best for me. I decided to go ahead and book the appointment with Lisa to discuss further and look at the products. Lisa went through what to expect, this information matched perfectly with what I had discovered myself, she didn’t try and sugar coat it (I have written an honest week by week sheet which Jenny and the team have, and will willingly share with you). Lisa took me through the daily routine which at first was quite daunting, especially at my age, as I wasn’t sure the information would stick! Lisa wrote everything down for me – phew! I had pictures taken at the start of my Aspire journey (pre and post sweetheart lift) and pre Obagi clearly showing all my imperfections. I had regular check-ups to make sure I was using the products correctly and that there were no problems. I believe Jenny, Aspire’s Clinic Director has used Obagi herself so she understands the different stages your skin goes through during its transformation. Sadly Lisa left Aspire before I finished my 24 week Nu-Derm course, but I am delighted to have Penny take over my skin care. Penny is very kind, patient and most importantly knows all there is to know about Obagi. Towards the end of my treatment (wk23) Penny gave me one of the Obagi peels that comes with the kit, you get two peels, one post treatment and the other you can have whenever you feel your skin needs a bit of a boost, these are not to be confused with the blue peel that makes you look a bit like a smurf for a few days. The Blue Radiance Peel is far gentler and complements the Obagi treatment – talking of which, it is worth booking a course ofDermalux treatments too as this compliments and calms irritated skin. I am now at the end of the treatment and boy what a difference, my age spot has completely gone, my skin tone is even and wrinkles have been greatly reduced. Would I use it again, without a doubt I would, it’s not the end for me as I am now starting on the Obagi maintenance programme. Please ask about reading my week to week experience for a greater insight into my own experience with Obagi Nu-derm. 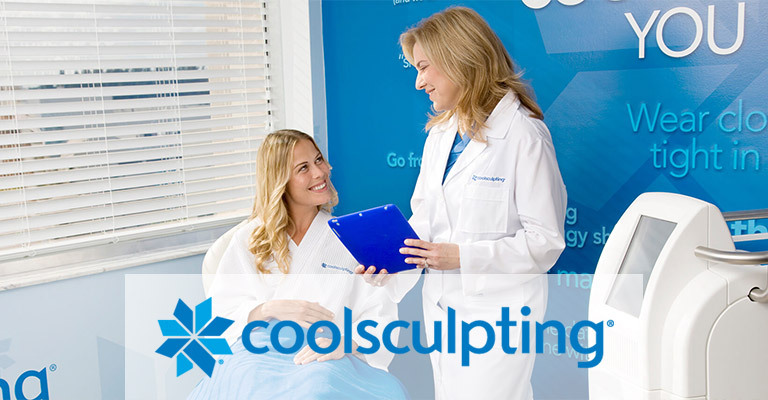 As the world’s number one non-surgical, permanent fat-reduction treatment that is also FDA-approved, CoolSculpting can tackle that exercise and diet-resistant fat that is really hard to shift. It’s the ideal treatment for permanently reducing fat and reshaping the stomach area, love handles, waist, inner and outer thighs, bingo wings, back fat, and even small areas like chin, knees and the area around the bra. Whether you want to sculpt, debulk or get your body ready for the beach this summer, let Aspire take you on a journey to achieve the version of you that you really want to be in 2019. And don’t forget, we also offer a 0% finance option on our CoolSculpting treatments. Book your complimentary consultation today, call 0118 931 3575 or email info@aspireclinic.com. *Ts&Cs apply: Offer applies to a treatment plan of 6, 8 or 10 cycles. For example, a typical tummy treatment would consist of 6 cycles, which would normally cost an RRP of £4800, however, book a treatment by the end of February and pay just £2400. Cycles can be used on different areas of the body, for example, 10 cycles could be used across the arms, flanks, inner and outer thighs. Offer cannot be used in conjunction with any other offer, discount or voucher. As the end of the year approaches, now is the time that many of us will reflect on the past 12 months. Did we achieve everything we set out to achieve at the beginning of the year? Did we make time for ourselves like we promised back in January? Are we ending the year happy with the way we look and feel? Or is the reality much the same as every other year; life is busy, everyone else’s needs come before our own, and we just accept the things that we’re unhappy with about ourselves? Happiness starts from within, and we all deserve to be happy with ourselves. Giving ourselves the time to achieve this is so important for our physical and mental wellbeing. Setting huge unrealistic and unachievable targets only sets us up to fail and feel inadequate. It’s the little steps that can go a long way to making a huge difference. You don’t have to settle for tired, dull skin. Nor do you have to accept a body you wish was slimmer. Ageing doesn’t have to mean we compromise on how we look and feel. There are solutions so you don’t have to say: “but I’ve had two kids”, “I just can’t get rid of my tummy” or “but I’m over 50 now”. Make time to be the best version of yourself in 2019…and Aspire is here to help you. We would like to invite you to our complimentary Wellness Inside and Out event on Friday 25th January from 12-2pm at Aspire Clinic, Madejski Stadium. Come along and speak to the experts about possible solutions for feminine wellbeing, stubborn areas of fat, ageing issues, skin conditions and much more. A light lunch will be served and all attendees will take away a goody bag. We don’t need much of an excuse here at Aspire to reward our wonderful patients with fabulous offers. And the festive season is the perfect opportunity for us to show our generosity! Once again, we shall be opening a door of the Aspire Advent Calendar each day in December to reveal an amazing offer you won’t want to miss. From £100 off wrinkle-relaxing injections to a free CoolSculpting cycle, we’ve got daily offers to suit everyone. But you will need to be quick…these offers will only be available to purchase on the day that they are revealed. Check the Aspire Clinic website daily or follow us on Facebook to find out what’s behind the Advent Calendar door each day. To redeem the offer, just call us on 0118 931 3575 or email info@aspireclinic.com. Agera Microderma System’s Mask and Activator make up the Skin-Sational gift set, giving a lift to tired, dull and congested skin. The two-step Microderma System to exfoliate and revitalise the skin cells, will give a smooth and radiant appearance to skin in need of a sprinkling of sparkle. Aspire’s Skin-Sational gift set costs £60 and is beautifully wrapped and ready to go under the tree. Give the gift of radiance this Christmas. You can burn the candle both ends this Christmas without letting it show with Aspire’s Revital-Eyes gift of an Obagi Elastiderm Eye Serum. Give your eyes a firmer, more resilient appearance with this clinically proven product that will help reduce the appearance of fine lines and wrinkles, improve the feeling of elasticity and firmness, and leave you looking brighter. Aspire’s Revital-Eyes costs £120 and comes in a beautiful gift box. Blink and you’ll miss it, so order one today! Whether it’s a preference for wrinkle smoothing, fat-reduction or skin rejuvenation solutions, Aspire’s gift vouchers are perfect for those who prefer to choose exactly what they want themselves. Recipients will enjoy Aspire’s red-carpet experience, including a full complimentary consultation with an expert practitioner to discuss treatment pathway options. Gift vouchers can be bought in denominations of £25, £50, £100, £250 and £500 and are valid for one year from date of purchase. Purchase your gift vouchers or gift sets today: 0118 931 3575 or info@aspireclinic.com. Do you dread laughing, coughing or sneezing? Does the thought of bouncing on the trampoline with the children fill you with horror? If the answer is yes, then you are probably one of the 40% of women who suffer from stress incontinence following childbirth. Aspire Clinic has the answer to combating this condition with its new treatment, Votiva; the ideal non-surgical solution to stress incontinence and other postnatal internal and external vaginal conditions, including muscle and skin laxity and painful sensations. Using the latest radio frequency wand that can be used comfortably on both internal and external tissues, Votiva is a quick, discrete treatment with no downtime, meaning, unlike surgery, patients can continue with their daily lives. And, results can be seen immediately. Votiva patients have reported experiencing immediate improvement to their stress incontinence problems, as well as being delighted with the external and internal reconstructive results of the treatment. Many women find talking about intimate problems extremely embarrassing, and would rather ignore the problem than seek help. Aspire Clinic’s team of experienced nurses ensure patients receive the best possible reassurance, advice and expert care before, during and after treatment. Let Votiva be the answer to get you running, jumping and skipping back through life. Aspire Clinic is holding a Women’s Wellness Evening on Tuesday 30th October at 7pm, where Clinic Director, Jenny O’Neill, who is a qualified nurse, midwife and health visitor, will talk about feminine wellness and be on hand to discretely answer any questions. To register your interest contact Aspire Clinic on 0118 931 3575 or email info@aspireclinic.com.